Here’s a note I put out last week to members of TTP Trading regarding three buy alerts issued on Friday, February 9th. Partial gains were taken in each of these three positions this week (NEWR 7.9%, TSE 8.3%, NUE 11.7%). I also closed half my position in WVE good for a 30+% gain in less than a week (alerted Monday sold Friday). This is meant to provide a better look of what I look for in setups and the type of content provided to members in case you were considering joining. With both myself and veteran trader CJ Argesta, we strive to provide a great value ($69/month cancel anytime) for members. On Friday I pulled the trigger on 3 new trades which I highlighted in my note on Thursday night. I had the majority of the portfolio in cash and with these adds, I’m now about half. CJ has done a great job with his overall market reviews, so I won’t hit on that too much. As mentioned before, I think the big test for the market is going to be once we start bouncing a bit. Will participants sell at some signs of recovery or will demand remain bringing the market to new highs? The long term trend is up but if any rally here gets sold and we make a lower high and lower low over the coming weeks / months it might mark a meaningful trend change. Like I mentioned in my note last week, I will be quick to deploy my cash in setups I like. I might trade a little quicker but will continue to take quality signals. Here’s the three I took Friday and alerted. 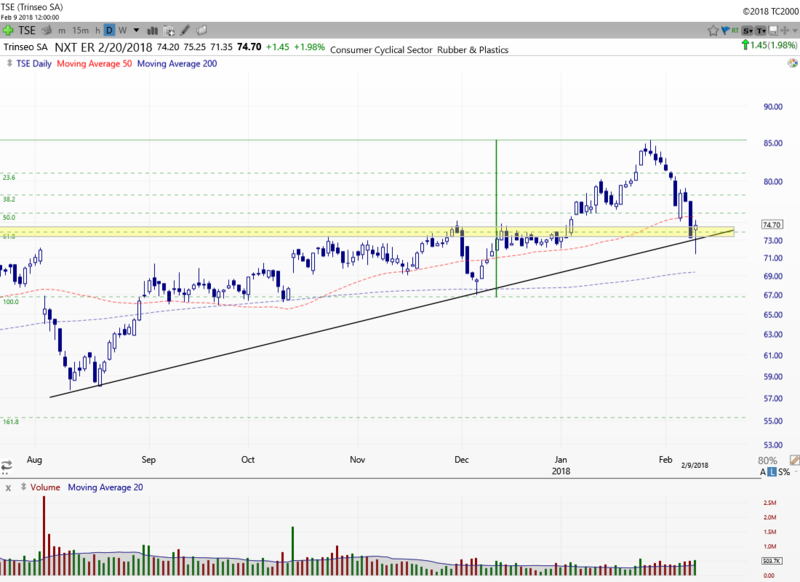 Nucor Corp (NUE) – A solid Steel company and a nice looking chart setup here. When I mentioned Thursday, it was too early to tell if the highlighted level would hold. Friday it did, bouncing off of it for a nice close. This area was resistance in October then broke through and acted as support in December. Based on Friday’s action, this initial retest was successful. Also, I added the Fibonacci retracement drawn from the November lows to the highs earlier this year. I don’t always use Fibs but find them very helpful in pullback type trades when they correspond with key horizontal price areas. Notice how it retraced to the key 61.8% level which coincided exactly with the key $60 price area that has acted support and resistance. This gave me additional confidence entering this trade. Does this mean this level has to hold? Of course not, but I do think this tilts the odds in our favor which is what trading is all about since the outcome can never be known. For my swing target, I’m looking for this to get back to the old highs in the $70 area. However, depending on how this one acts and how the overall market acts, I might sell a little quicker depending on how it reacts to the $64 area which was a prior consolidation zone and is around the 50 day MA. Stop around $58.50, just under this area and the 200 day MA. Trinseo SA (TSE) – This Rubber and Plastics company has almost an identical setup to NUE. This $73-$74 area is critical and it bounced nicely off of it Friday. Also, like NUE, the price retraced 61.8% of the move from the December lows to the January highs. This has earnings coming up soon – 2/20. If it wasn’t for that, I’d target the $85 area for swing gains but that would be a rather quick move and I don’t want to be holding a full position into the announcement. As such, if we get back to the area around the $78 consolidation level, I will likely sell half of the position and hold the remaining half through the announcement. Stop around $71 which just below Thursday’s lows. With earnings coming, I’ll be actively monitoring this position and will be sure to alert any actions taken. We still have over a week to see how this develops. New Relic Inc (NEWR) – This software company reported earnings last week and the reaction was favorable. This held up really well when the market was getting sold late last week. 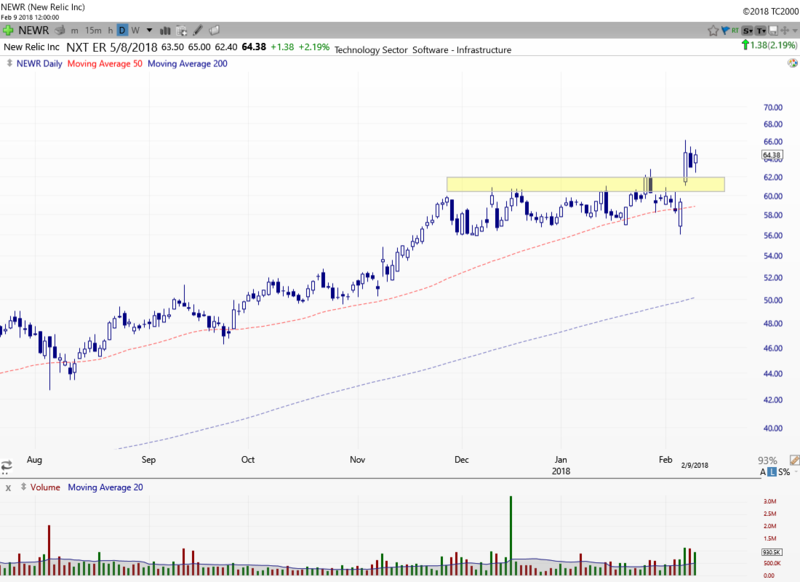 This is a breakout trade and has no overhead resistance if it continues to move up. As such, there’s no historical price level to determine when swing gains should be considered. Given, the past price action and volatility of this one, I’d like to capture swing gains in the 10% area. We’ll just have to see how price moves and if it goes aggressively up and starts to show signs of consolidation, that would be a good area to sell half of my shares. Stop area around $58.50 here. 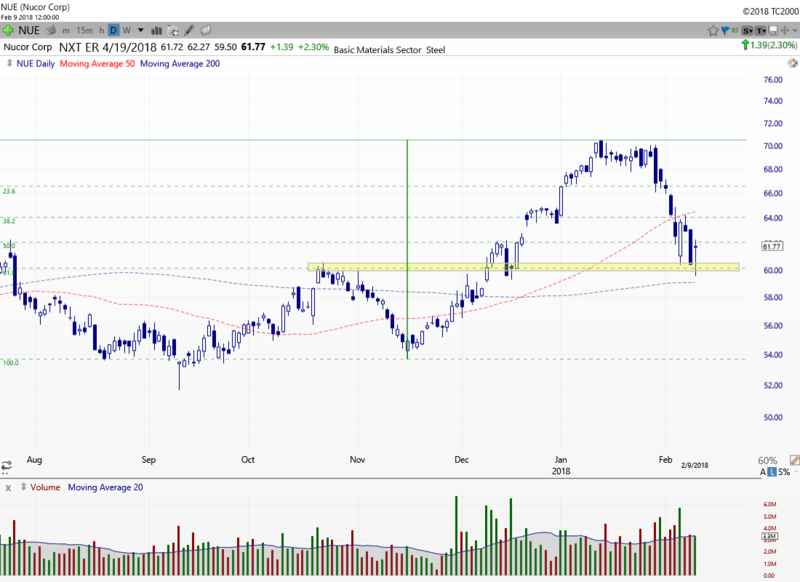 Lastly, if you missed the BlackBerry (BB) trade and were looking to get in, it is currently setting up nicely. This is one I took quick swing gains of 8.5% after a couple of days and am in trending mode for the rest of the trade. Those remaining shares have got taken down with the market lately, and much of my gains have been unfortunately erased (6% gain right now on remaining position). This one is now back to this key price area and a run to the old highs would be a 20%+ move. 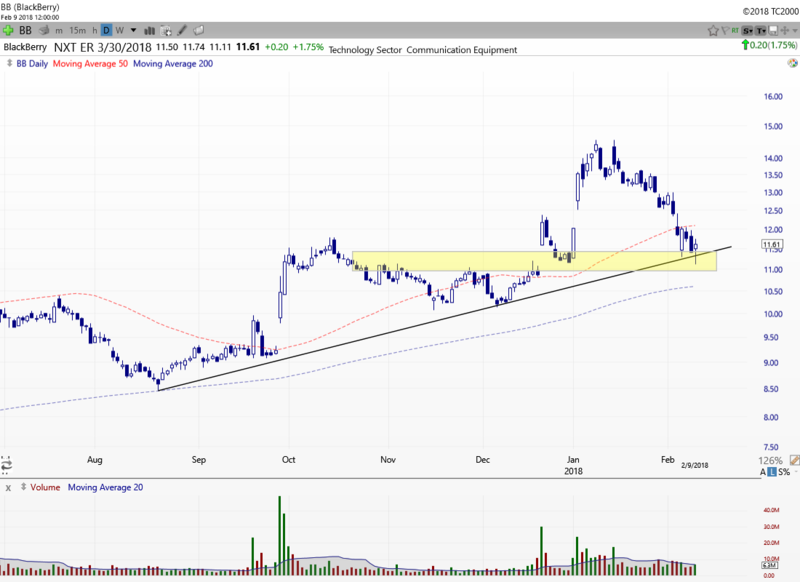 If it goes against me, I’d get out below the 200 day around $10.50. As always, thank you for your membership and please reach out with any questions. Thank you.